This month's box was a bit different and I really liked the design. It also came with blue wrapping paper. I like to keep these boxes to store the products in. I was excited as always to receive my Birchbox. 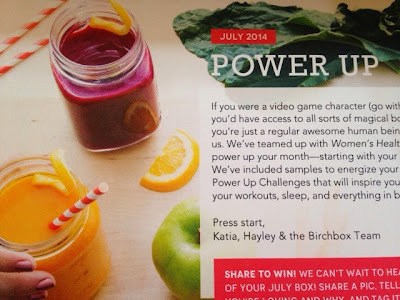 This month's theme for July 2014 was Power up and Birchbox teamed up with Women's Health. 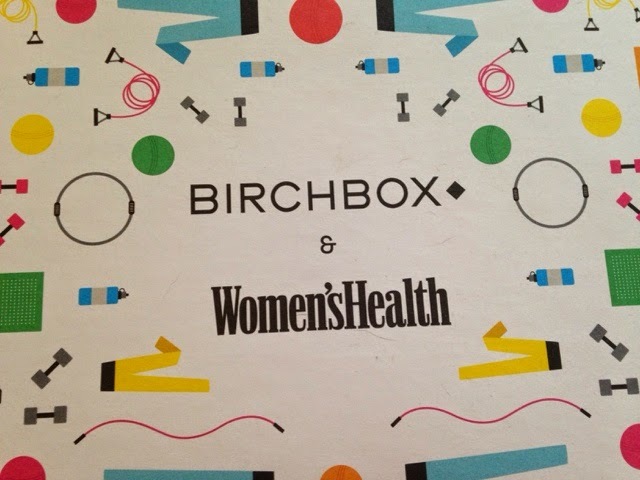 The box came with a booklet on tips for staying healthy and a one year subscription to Women's health. However, I will forgo the subscription as I am not a huge fan of receiving paper magazines. I used to get them all the time but, they take up space. I would much rather order the digital copy of the magazine. I am not sure that is an option so I will have to look into that. There where lots of great products this month and products I will use. I haven't tried this product yet but I am a big fan of dry shampoos. My hair is really thin and does not have much volume and get's oily really fast. Especially in the summer months. So, I always like to use dry shampoo to give my hair a bit of lift. I have heard oat is really good for the skin and hair. So, I am excited to try this product. This smells good. It has more of a natural clean smell. It also smells a bit spicy like ginger and lemon. I haven't tried this yet as I still have another lotion I am using that I really want to use up first. I think this is a generous size because I got another size like this in my Birchbox about two months ago and am still using it. Between my Ipsy and Birchbox I am well stocked up on lotion and perfume. This is a beautiful Royal blue color. I am excited about this product because I don't have an eyeliner color like this. I have a greenish aqua blue with shimmer which I really like. I like that this is a pencil and more matte looking. I tried this product as I was out of a facial cleanser. It did leave my face feeling clean. It goes on more like a lotion and does not really suds up. It did not seem to remove all my makeup though. So, I would suggest using a makeup remover and then using this product. I am going to try and use it that way. It definitely has a clean soap smell to it. This was marked as being an extra. I did not open them as they are in two foil packets. I had hoped these packets would be bigger but they are the size of ketchup packets. When I use them I imagine I will need to use both packets. I haven't tried it yet as I am actually not a huge fan of body washes. I want to try to use them more but I have very sensitive skin so I'm a bit cautious when it comes to trying new things. I usually use a hypoallergenic soap. I have used Fresh detox body milk bath in the past and liked that. So, I wonder if this will be similar to that product. Overall, I was very pleased with my Box. 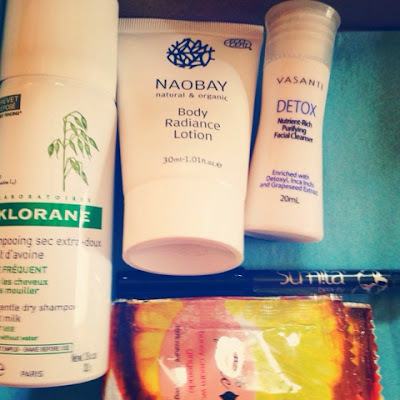 This is my third Birchbox and I always enjoy getting this box and will continue to get it. I just wish I got more makeup although getting the body products is not bad and I will eventually use them. 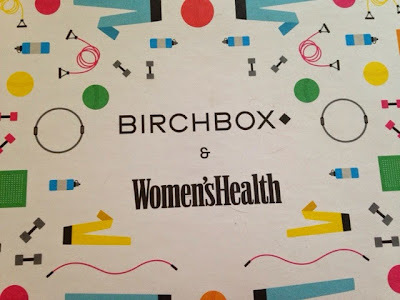 Birchbox is $10 dollars a month and is a monthly subscription box. You can fill out a profile and they will tailor the products to the things you like as much as possible. If you would like to sign up you can use my link. However, you don't have to. I get points to go towards future purchases if you do. As Always I pay for this box myself. This is not a sponsored post.